Matthew Paras: Well Ben, it happened. I think it’s already clear how I feel about this move, but I wanted to get your reaction. Ben Gartland: I’m very happy with this move. There seemed to be progress at the beginning of the conference season and, on paper, they did make progress with six conference wins. However, with a lackluster non-conference season and losing 11 out of their last 12, it became very clear that this team did not make adjustments throughout the year and in year five that’s unacceptable. It was time. Paras: I definitely agree. I’m a little surprised that it was a resignation after Purnell seemed so set on coming back a week ago, but we don’t know what went on behind the scenes. But now we’re at a time where this next coaching pick has to absolutely be a hit. There’s going to be names that come up here and there, but the first one you think of has to be Ben Howland. Gartland: Absolutely. It’s no secret that guys named Ben know basketball, and Howland really knows basketball. On a more serious note, Howland is the cream of the crop with the coaching lineup right now. 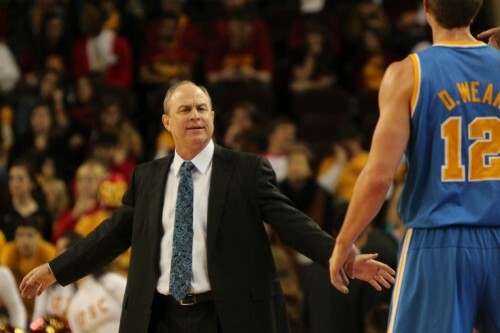 He has experience quickly turning around teams, taking Northern Arizona and Pitt to the NIT in his second season respectively, and UCLA to the NCAA in his second season. He’s also been to the top, going to the final four with UCLA three times in ten years, plus recruiting guys such Russell Westbrook and Kevin Love is a dynamite list. He has the most impressive resume out there, and if DePaul is looking to show fans they’re serious about contending, they’ll seriously consider going after Howland. Paras: I think the risky part with Howland is how much DePaul will be willing to spend after coughing up so much for Purnell without the expected results. What I like about Howland, though, is what you said. He’s a very aggressive recruiter, which is what DePaul needs. The biggest problem that Purnell had is that he was too much in a hole with not knowing the area. Howland might face that similar problem too, but at least he has a reputation for making an impact with these kids. Getting Love and Westbrook, like you said, is a massive improvement over guys like [first name] Booker, one of Purnell’s better recruits at Clemenson. When looking at the next type of head coach, I think the biggest thing will be if he can recruit in the Chicago area. DePaul can’t afford wasting years with someone who is trying to play catch up. Gartland: One of the problems you mentioned was the cost of Howland. If there was a cheaper coach with a less impressive resume, but ties to the Chicago area such as former DePaul player Rod Strickland, would you take him? Paras: Strickland is a really interesting name to me because while he doesn’t have that much coaching experience, he has experience of a long NBA career and, obviously the DePaul connection. With him being a former point guard, it’s somewhat exciting to think what he’d be able to do with Billy Garrett Jr. and how to get the best out of him. Strickland, who’s an assistant at the University of South Florida, is a name we might hear. There’s also other DePaul alum like Ty Corbin and Mark Aguirre. In Corbin’s case, he has NBA head coaching experience and played under Joey Meyer. Aguirre’s expressed interest in being a head coach. I’m a little bit worried about whether those three could be able to sell the program though as first time college head coaches. Will they be able to connect to a different generation? Gartland: And that’s the risk that is run with an inexperienced coach. At this point, I’m more willing to hand the reigns off to an older coach with the experience like Howland. There needs to be someone who can get DePaul back to a respectable level and restore some dignity to this program before they take a risk with an up-and-coming assistant. Another big thing needs to be finding a coach who has a proven track record in developing players. It’s one thing to get them to Lincoln Park, it’s another thing to get them to the next level. Paras: Well, we’re a little bit lucky in that regard. From a personnel standpoint, I think the next DePaul head coach will be inheriting a team that has more talent on the overall roster than what Purnell started with. No disrespect to that squad, but there’s a reason that team finished 8-23. To make matters worse, Walker graduated and Koshwal left prematurely for the NBA. So putting it in a Purnell perspective, he comes into a new city without many connections and a roster with a giant void. That doesn’t excuse the lack of progress, but there’s no wonder why he didn’t succeed at first. With only three players — Jamee Crockett, Forrest Robinson and Greg Sequele — graduating, there’s talent on the Blue Demons. We’ve all seen what Garrett is capable of, but Myke Henry, Rashuan Stimage and Tommy Hamilton all showed really great flashes of brilliance. Aaron Simpson, R.J. Curington and Durrell McDonald are good energy players that can provide a spark. Yes, the Blue Demons floundered down the stretch, but the talent with a better coach can be there. Now, it’s up to see who fills that vacancy. Maybe DePaul should have someone else decide the new DePaul head coach given the track record of the last two head coaches at DePaul. JLP will screw it up AGAIN.